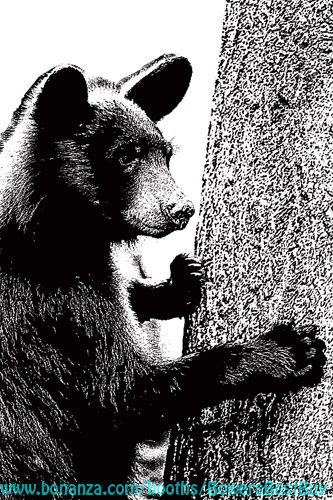 american black bear cub printable art print png clipart downloadable digital image graphics printable animal nature art prints commercial use allowed original bear art i created on the computer. This is a digital jpg and a png file at 300dpi. Just purchase download image then print it out This image is 8.9" x 13.4" inches at 300 dpi THis is NOT a physical print it is a digital file that will be sent to your email for you to download and print out yourself. Light Commercial use is allowed . Just purchase download image then you print it out PLEASE DO NOT REDISTRIBUTE or share images,, DO NOT RESELL this image!,. You are more than welcome to create anything you want that is a Physical good. You can even sell whatever you create. You MAY NOT resell these images as your own digital images or use them to create any other form of digital media whatsoever and that includes cds. Not to be sold on sites like cafepress, zazzle, red bubble etc... each image may be printed and used up to to 200 times. because this is a digital file sent to you via email there is no shipping involved therefor no shipping fee is charged.